Lemon Bay Playhouse will host “Comedy Night - Are You Experienced?”, an adult performance, on Saturday, December 29 at 7:30pm and Sunday, December 30 at 2:00pm. Don't trust anybody under 30 with your funny bone? 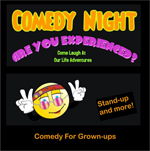 Then come laugh at the life adventures of "mature" comedians in a night of stand up, skit and song parody comedy. These semi and professional local comics and actors range from almost 50 to 70 plus! They've been there, done that, and want to leave you sore from smiling. Special guests include North Port's cruise comedy king, Gid Pool, and Visani's Got Talent winner, Lynn Lane. These folks always sell out so advance tickets are strongly suggested. Reserved seat tickets are $20.